What’s your favorite ice cream shop? Mine is Maggie Moos…though lately the evil Coldstone has been trying to push them out of business. 🙁 I don’t know what people see in Coldstone; Maggie Moos has more creative flavors (or maybe I just mean fewer fruit-dependent flavors), and the ice cream is creamier. 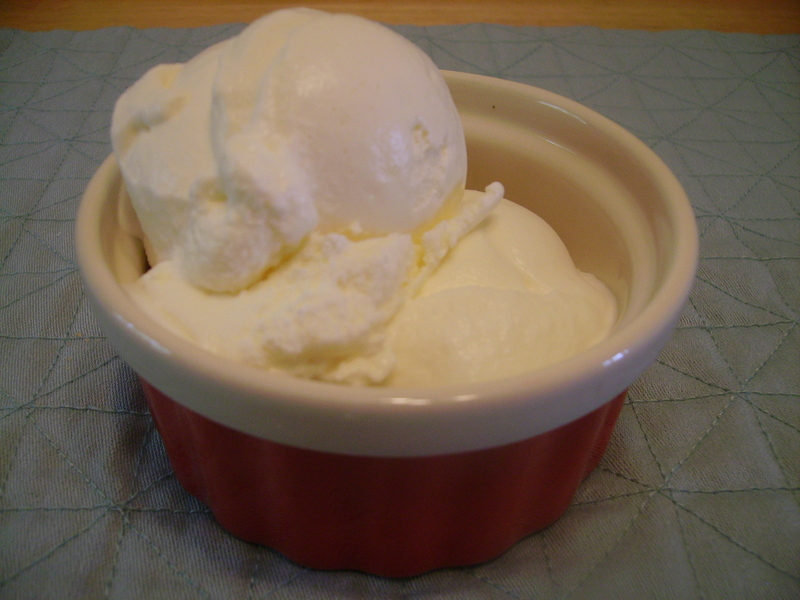 But whether you like Maggie or the evil conglomerate, sweet cream is a wonderful flavor, one of Dave’s favorites, and I know you will enjoy the simple elegance of this ice cream! What is the one dish you can’t live without at a potluck dinner? The one you search for as you walk down the table, past all the potato salads and macaroni salads? That’s right. Deviled eggs. Deviled eggs are probably the easiest dish to make ever–and if your family is like my family, one of the fastest to disappear. 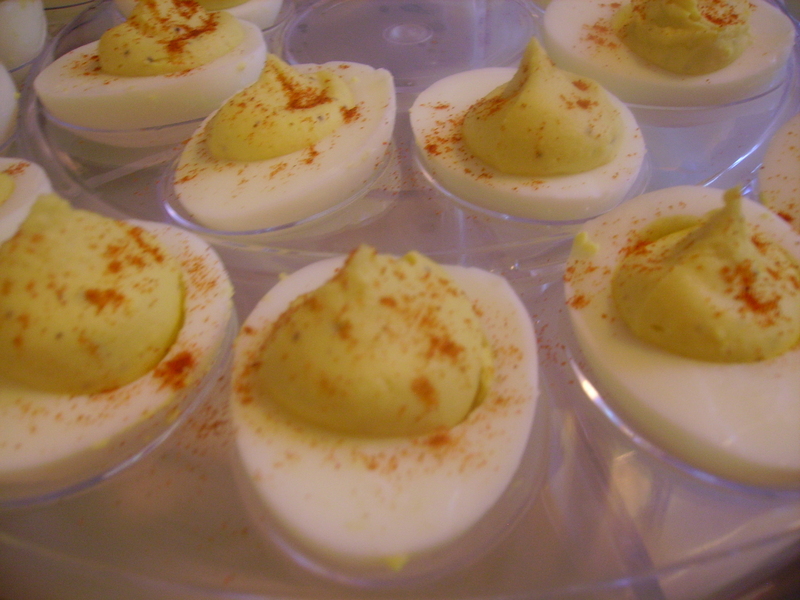 Everyone has their own variation, their own secret ingredient…that’s what makes deviled eggs great. You never know quite what you are going to get! Me? I like to put Worcestershire sauce in mine. I lucked out in the grocery store this week…Harris Teeter had a sale on fresh, wild Alaskan salmon. It was such a beautiful color of bright red that I practically drooled on the glass case. By the way, if you didn’t know that your fish guy will skin the fish for you, I highly suggest you start taking advantage of that! So with my prize fish in hand, I set off to decide what to make out of it and I landed on an old Rachael Ray recipe I’d saved. One of the first recipes I ever saved, in fact. Back when I was in college, I caught the foodie bug. Unfortunately, I didn’t exactly have a fully stocked kitchen at my disposal, so I couldn’t run out and make much of anything too easily. I had to learn to “taste” recipes with my mind to see whether they would be any good. I am not usually a big Rachael Ray fan, because I like doing things the hard way and, well…I don’t eat meat. But boy did the citrus vinegar glaze she concocted here sound like it would taste delicious. Trust me…it does. My husband, who tolerates salmon for my sake but really doesn’t like fish that isn’t sushi, actually told me he liked this! He said the sauce made the dish. 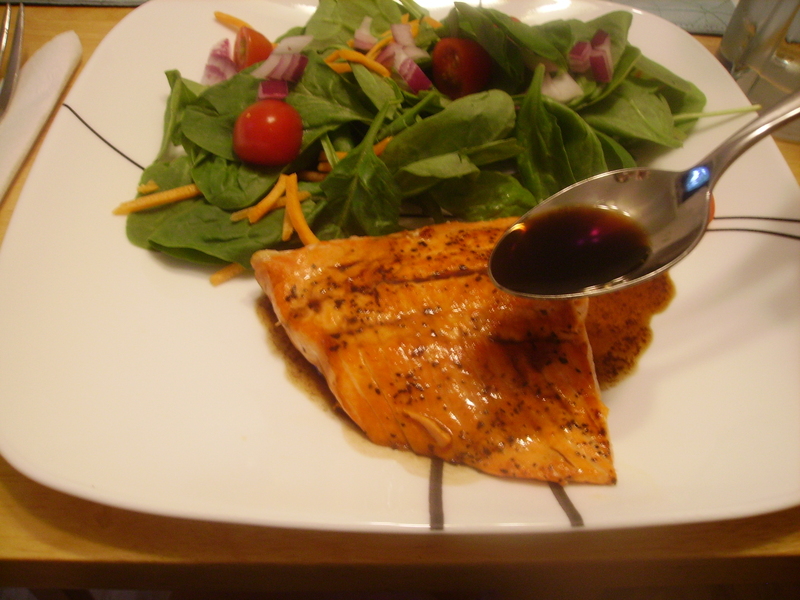 Even if you don’t like salmon, the citrus vinegar would work well over a salad, so I highly recommend you try it! Muffins are pretty much my favorite food. Well, make that all breakfast baked goods. But muffins, my friend, top the charts. I’ve had my eye on these muffins for a while now, and I’m glad I finally made them! The flavor is rather mild, but the hint of spices and the pecans on top give each bite something special, and occasionally reminded me a little bit of pecan pie. 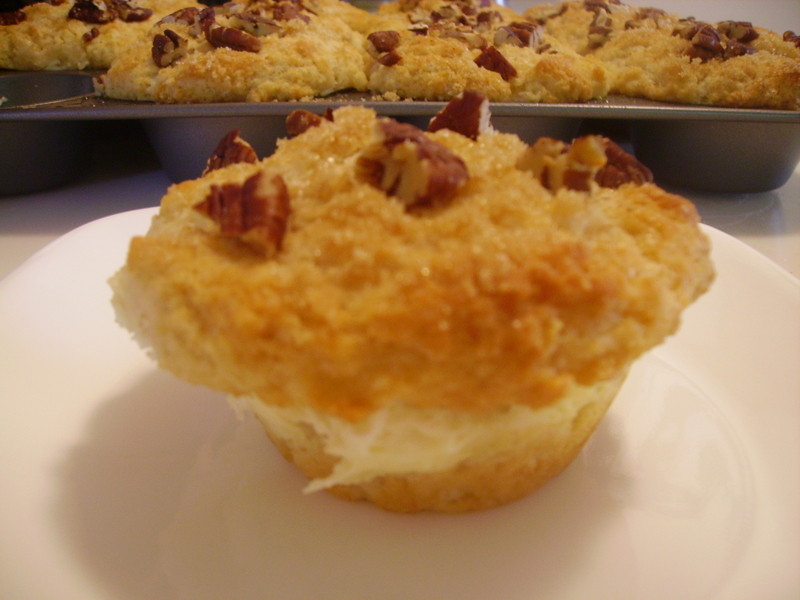 Because of the yogurt and absence of eggs, these muffins are dense, like a bakery muffin with half the fat. But by far and away the best things about these muffins is the sweet, crunchy cap and the subtle, creamy filling. The main drawback to these muffins is that they are not the simplest breakfast food in the world (unlike oh, say…almost any other muffin). They require a lot of hands-on effort, and while none of the components are actually tricky, these are definitely best for a plan-ahead or weekend breakfast treat. One of the challenging aspects of being a vegetarian is how hard it is to find Italian food. Most Italian restaurants only offer vegetarian options that consist entirely of carbs, cream, and cheese. I shouldn’t really complain about that, because homemade ravioli is heavenly, but I do often find myself wishing for more variation. The bright shining spot in the pasta world is primavera. Primavera–which literally means “spring” in Italian–can really be made with any vegetables and any type of pasta you want, which is fabulous because you can eat in all year long with seasonal produce. I’ve seen it with marinara sauce and cream sauce. Basically, anything goes as long as you leave the meats elsewhere. I like my primavera with a white sauce and tons of vegetables…you know me, any excuse to add another veggie is one well worth it. Though, when I was sautéing the veggies, I was seriously worried that I had managed to outdo myself and the pasta:veggie ratio would end up like 1:4. Happily, it was just right. The vegetables should be the star in primavera, so I didn’t want to drown them in a heavy sauce. Thus, I searched until I found a sauce that sounded delectable without being too overpowering (or as high in calories as a standard cream-based sauce). 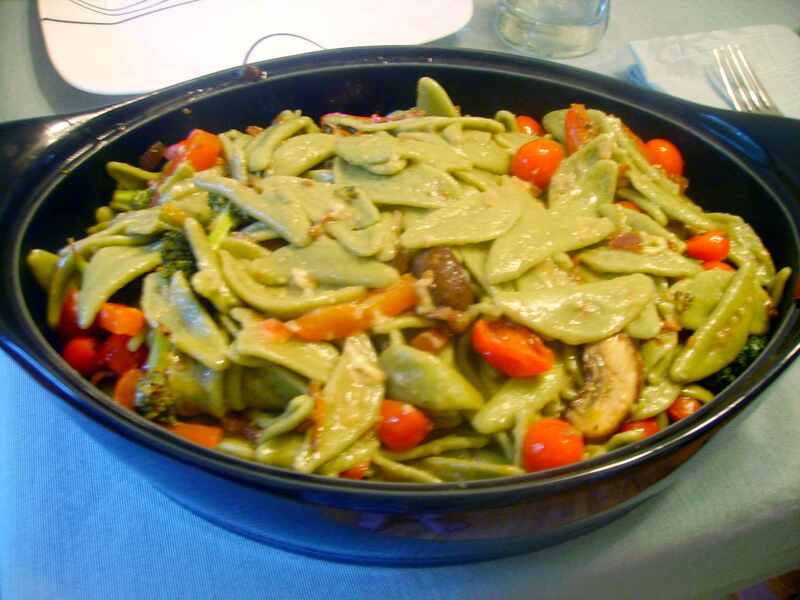 My husband raved about this pasta, and even said he loved the vegetables (! ), so I think the sauce did its job in highlighting the produce rather than overpowering it. Sometimes I try to do the majority of my prep while also cooking other components of a dish. It’s at such times when I realize how slowly I do things like shuck ears of corn and dice…well, anything. And how quickly onions burn. Still, somehow these stuffed peppers came out very well! No doubt because of the incredibly fresh, local goodness of the vegetables themselves. This past week, my friend Sarah of Well Dined lent me her CSA share while she and her husband took a trip across the country. Never heard of a CSA? It stands for Community Supported Agriculture, and it’s a program through which you can buy a share of a local farm or network of farms. You help support them as they are getting their crops going for the summer, and in return, you get a carton full of awesome fresh fruits and vegetables each week. 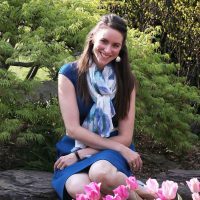 So, thanks to Sarah, we were blessed this week with fresh ears of corn, green bell peppers, eggplant, tomatoes, heirloom grape tomatoes, red and white onions, baby potatoes, granny smith apples, peaches, pears, and a cantaloupe. And some wilted chard. Oh well, only one dud among all that goodness! So how did I use this bounty? Dave inhaled all of the fruits within a day and a half. 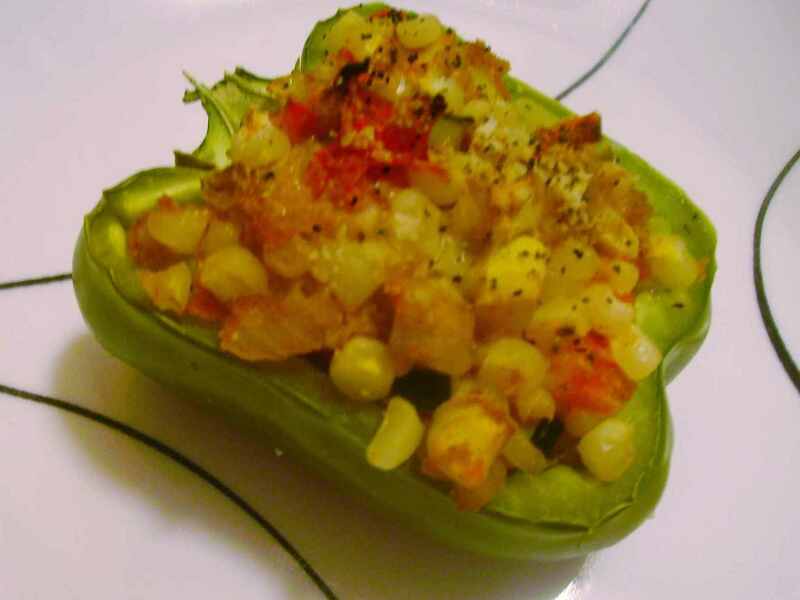 And about half of what was left went into these stuffed bell peppers. Yum. Have you ever noticed that by the time you get halfway through a plate of alfredo, you don’t like it anymore? That will not happen with this sauce, my very slightly healthier spin on an old classic. 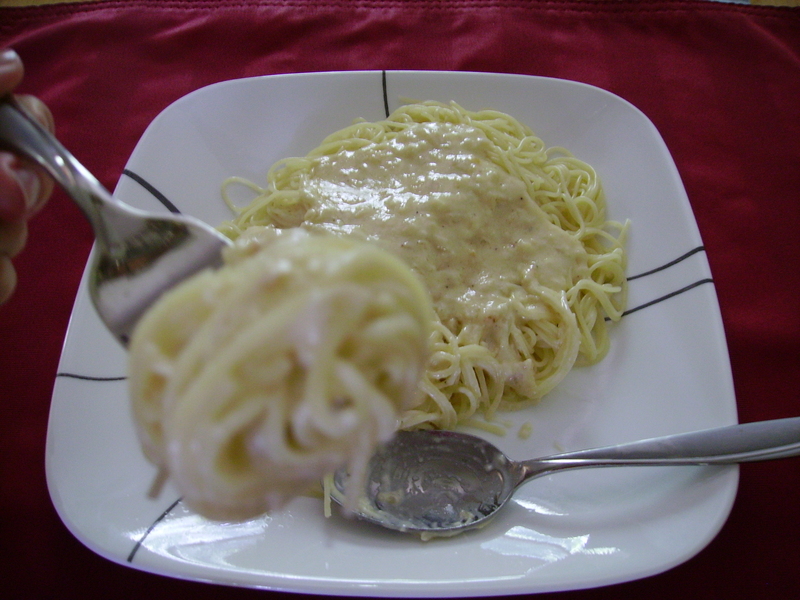 Though I would be lying completely if I told you that the chief downside of alfredo sauce (er…the enormous number of calories) was actually improved. But just eat a big salad and go for a walk and put it out of your mind! This is one of the simplest pasta sauces you could ever make. It’s just as easy to make a single serving as it is to whip up a batch to serve 8. Every time I make it, my husband gets really excited, and I think you will get excited, too! I have never liked canned tuna. It’s usually mixed together with mayonnaise and pickles…two of my least favorite things. But I LOVE tuna steak. So every now and then I do recipe searches for tuna, and in this particular case I overcame my distaste for canned tuna and I am really glad I did. This burger is delicious, filled with veggies and spicy Sriracha. It does use canned tuna, but I buy a nice-quality yellowfin, which is less processed than some other tunas, and thus a bit tastier. 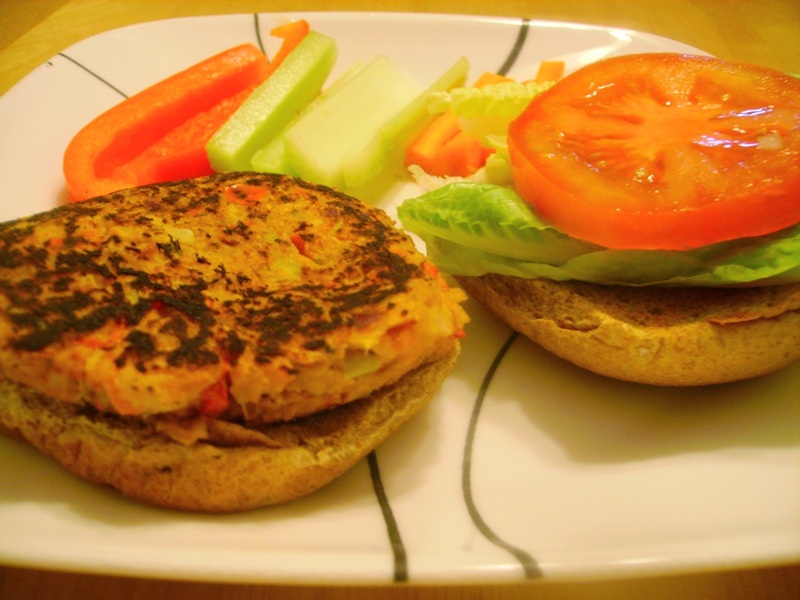 The whole combination makes a very loose, soft burger that is excellent alongside the extra fresh veggies. I will say that the Sriracha really does pack a punch, so if you are not big on spicy, you might want to substitute ketchup for half or all of the chili sauce. 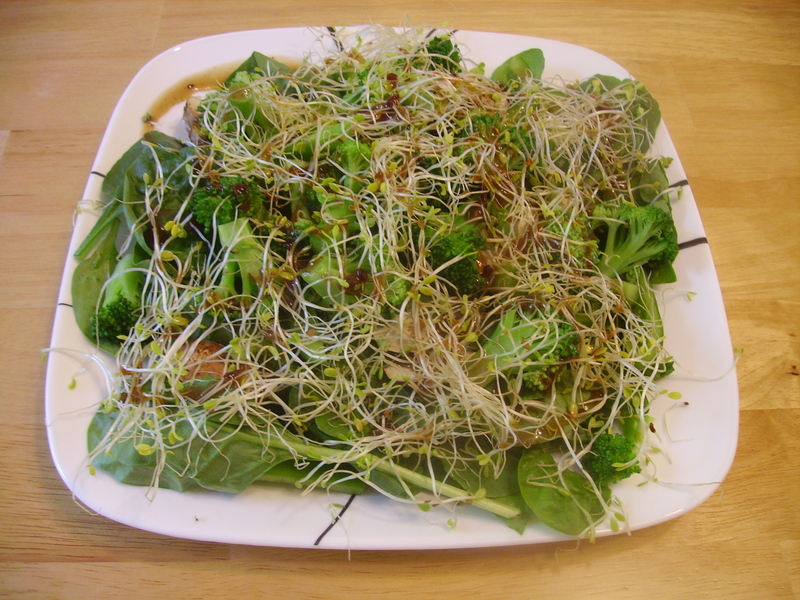 If you don’t eat red meat, this is a complex, tasty alternative to a hamburger! 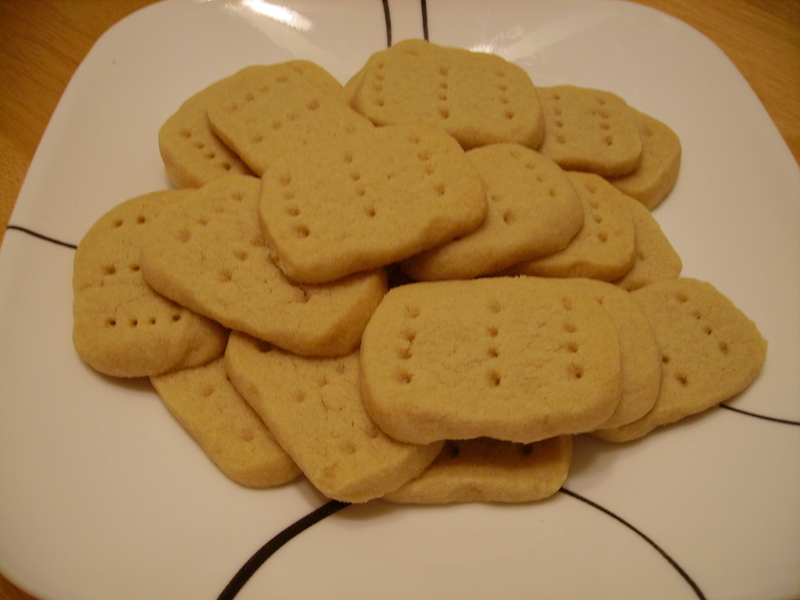 Shortbread is possibly the simplest cookie on the face of the earth. With only three basic ingredients, you can make almost infinite variations, but all you really need to have on hand is butter, sugar, and flour. These cookies are great alongside coffee or tea. They are crunchy but still a little moist, and just barely sweet. I really like the brown sugar because it adds a little depth to the cookie. Try these! I know you’d like them.